"A quirky romance, threat of a nuclear disaster , and a neon-drenched 80's L.A. collide in this visceral underrated gem"
Every so often a film comes my way, whether I'd heard about it before or not, that completely blows me away. Even more so when I realize that said film flies so far under the radar of most moviegoers, that it's damn near criminal. This is one of those films, and it could very well be one of the most underrated films in history, and one of the best, most intense films about the threat of nuclear war ever made. Sure, there are others out there. But none are as uniquely special as this one. Harry (Anthony Edwards) meets the love of his life in a chance encounter. 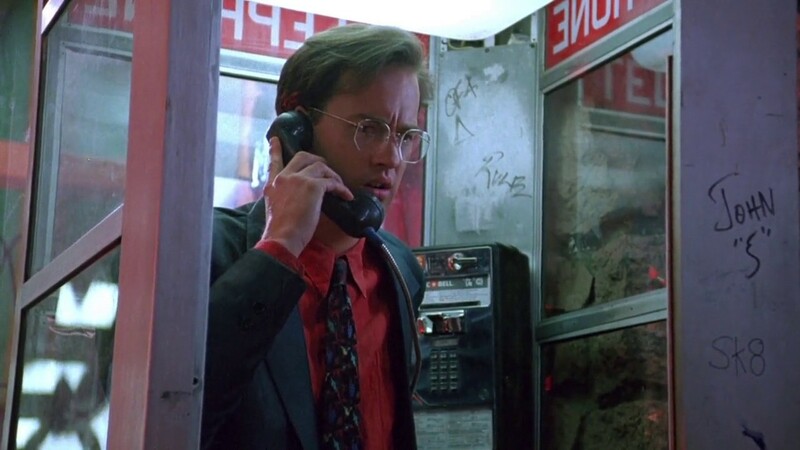 When he misses his second date with her, he tries calling her from a payphone to no avail. But then the phone rings. Thinking it's her, he picks up, only to hear a scared and agitated man on the other end warning of a nuclear war that will happen in 50 minutes. Harry doesn't know what to make of that news, but knows he must find Julie (Mare Winningham) and try to flee in case it is true. Harry soon descends on a dark surreal odyssey through the streets of L.A. in the middle of the night, while the city falls into utter chaos. Immediately upon it's opening credits, something is starkly clear; this is going to be something special. 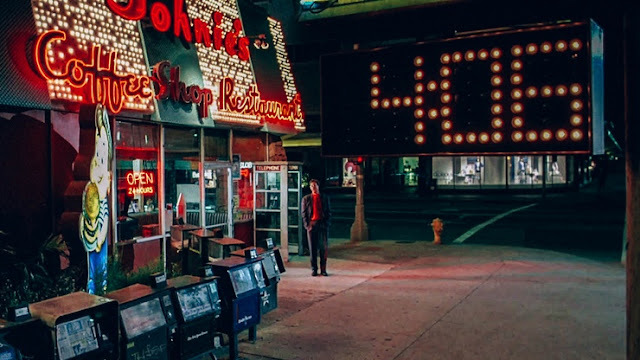 From the very first frame, Miracle Mile presents to you, the viewer, with incredible visuals and similarly impressive compositions that only someone who's heart and soul is in it could render. Writer/director Steve De Jarnatt spent insurmountable time in framing each shot to perfection in such a way that very few films can convey. Watching this film you know it's his baby, and he takes great pain's in giving it life. And next to the films tone and subject matter, that's the biggest thing that left an impression on me. 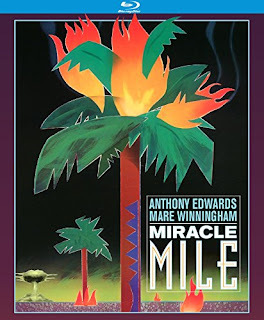 Miracle Mile looks fantastic, and it's mind-numbingly frustrating that De Jarnatt didn't get a nomination at any awards for his direction in this. So many of the images presented here will stay with you long after the film is over, and that's a quality you just can't manufacture tediously. It's a gift, and Steve De Jarnatt has it. It also helps that he worked alongside his Dutch cinematographer Theo van de Sande, who a few years later would deliver more amazing visual work with some of my personal favorite horror/thrillers like Body Parts and The First Power. This dream-team of visual power culminate in one of the most visually arresting films I've ever seen. But it takes more than just the visuals to tell the story, or to keep you invested. De Jarnatt's script is sharp, engaging, quirky, exciting, thrilling, scary, intense, charming, and most of all, fascinating. Then there's Anthony Edwards and Mare Winningham, who do a phenomenal job as the two love struck 20-something's who fall head over heels in love, only to have that love tested immediately. Tangerine Dream's electrifying and immersive synth score add yet another layer of genius to the table, further cementing their status as one of the most talented and influential synth prog rock composers in the industry. This score was fantastic. I've since been listening to it via YouTube for days and I just can't get enough. How this film never gets the love it deserves blows me away. Because that's what this film did. It blew me away on such a visceral level that I haven't been able to stop thinking about it ever since I saw it. It hit's you on such a raw level. Though the film, at it's core, is a bit quirky (in the best possible way; think After Hours and Into the Night), it hit's a nerve because it's done in such a strong and far more serious way than either of those films. It's like the most intense version of that special kind of quirky 80's "serious boy meets free-spirited girl" love story, only set against the threat of a nuclear disaster filled with awesome cameo's and a killer ensemble cast that was impressive as it is freshly exciting. Seriously. The nonstop barrage of notable character actors and faces you continually recognize throughout the entire film was a lot of fun, and though they weren't big back then in 1988, they've certainly become cult icons in their own right. My personal favorite, and one that took me completely by surprise, was the one and only Brian Thompson, here stopping in towards the final act to deliver one of the more memorable small roles, and absolutely killing it in his very brief screen time. 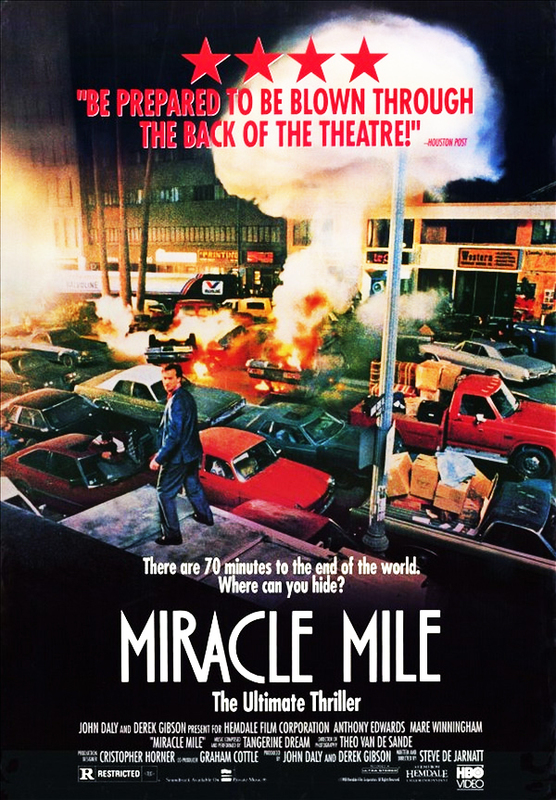 Visually, Miracle Mile is a tour de force of the senses. Director Steve De Jarnatt painstakingly sets up each shot with such precision, you'd think he'd been directing films for decades. Yet, oddly enough, his only previous full length film was the low-budget sci-fi cult classic Cherry 2000, which I really need to revisit now. So it's safe to say that nothing he'd done previously, certainly not the single episode of Alfred Hitchcock Presents (his only other directing credit prior), would lead you to believe he was capable of delivering such a riveting slice of cult cinema. But it happened, and it's happened time and time again. It's a rare thing indeed, but not unheard of. The most recent example for me would have to be John Patrick Shanley's incredible directing debut with Joe Versus The Volcano. Another quirky romance that was as magical as it was darkly gothic in the most delightfully twisted way. Here, De Jarnatt's unconventional approach to somewhat unmarketable material proves that you can still breathe some life and vigor into a scary topic. It's just remarkable that most people have never seen it. The scenes that seem to make the rounds more than any other are the ones of Harry (Edwards) either by the phone booth, or standing in the midst of a traffic jam as cars lie upside down and aflame around him. But the film is so much more than that and really, that's just a tiny bit of it's appeal. Sure the allure of the nuclear disaster, or the "big one dropping in less than an hour" is what pulls you in, but there's so much more going on. 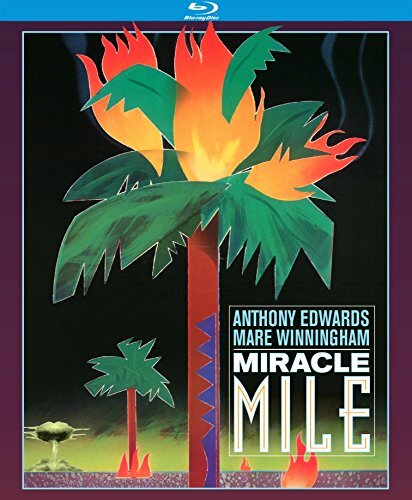 Harry encounters countless colorful characters, some who aid, others who impede, his quest to find the love of his life, Julie (Winningham), who's home heartbroken and hurt at their broken second date, completely unaware that Harry is literally going through hell to find her so they can escape in time. It's all of those random encounters, (some scary, others positively life-changing) that build the mild-mannered Harry into a stronger, more confident man. The kind of man who would tear through a city, no matter the cost, putting his life on the line and nearly getting killed multiple times in the process. In Harry's mind, if he's going to die anyway in less than an hour, he would rather die trying to find Julie and escaping than sitting idly by for the big bomb to drop on the city. He's never known happiness like he just experienced earlier that day, and the thought of spending just one more moment with Julie is worth risking his life. 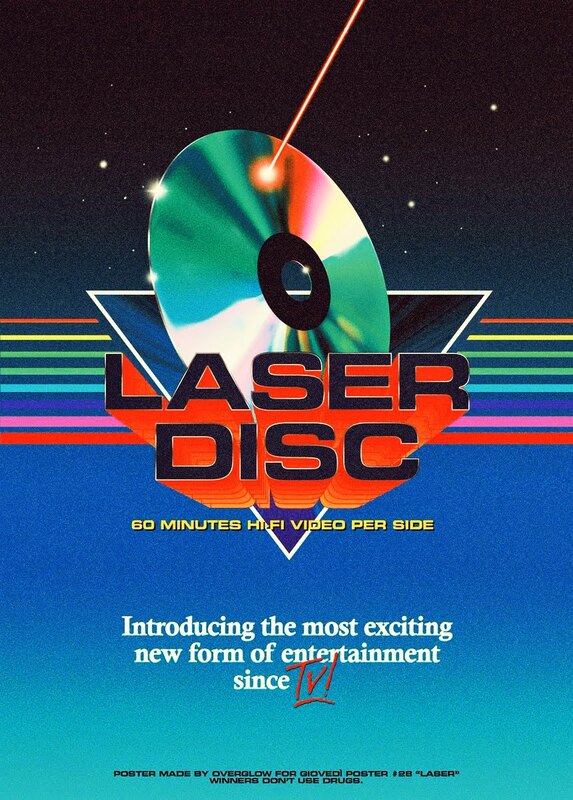 I remember vividly seeing this cover at every local video store I would hit on a regular basis in the 80's and 90's. As intriguing as that cover is, I never made the effort to actually rent it. And it wasn't a film that I ever remember coming across on HBO or Cinemax, because if I had, I would surely have made the time to watch it. And until this very year, I've never heard anyone actually bring this up, discuss it or recommend it. How?? It blows my mind. We're talking 29 years since it's release, yet that's exactly what happened and it's criminal. Instead, it took a random comment somewhere online to strike a chord with me and finally make the effort to hunt it down, and I'm so glad I finally did. Do I feel dumb for waiting so long to finally see it? Sure. Because I can guarantee you, I would have loved it just as much as a teenager as I do now. I might not have appreciated the quirky love aspect to it (then), I most certainly would have been immersed in it's haunting imagery and amazing visuals. It's the type of film that is so hard to categorize, so hard to pin down in any specific genre. I put it in there with films like After Hours, Into The Night and Joe Versus The Volcano; all uniquely riveting films that dare to be different in the most unconventional yet completely fresh way. If you've never seen it, or it's been a while since you have, I urge you to seek this one out. It might very well be the best hour and a half you've spent watching a film in a long while. Fun Fact: Steve De Jarnatt also co-wrote Strange Brew in 1983. Go figure. Miracle Mile has been release on VHS, Laserdisc, DVD and most recently by Kino Lorber on DVD and Blu Ray in 2015. Any of these releases can be picked up on the cheap for under $20. I watched the Kino Lorber DVD, which comes packed with interviews, commentaries and a mini-reunion of it's two main leads. I can tell you that the DVD transfer was excellent. So excellent in fact that honestly, I can't imagine the Blu Ray looking any better. That's how good the Kino Lorber DVD quality is. Since I don't actually own a copy of this film yet, as I rented it through Netflix, this NEEDS to be in my collection because I already know it will be a film I will want to revisit again and again and I will want to introduce unsuspecting friends to it and watch their minds get blown. So I will ultimately grab the Blu, just so I know in the back of my head it's in HD.